Possible Bodies (Jara Rocha, Femke Snelting) es una investigación colaborativa en las entidades muy conretas y a la vez complejas que son los "cuerpos", preguntando por qué condiciones material-culturales de posibilidad los hacen presentes. Esto se hace espacialmente urgente en contacto con las tecnologías, infraestructuras y técnicas de traqueo 3D, modelado y escaneado. Una intersección de asuntos de raza, género, clase, especie, edad y capacidad emerge en estas prácticas performativas y representacionales. La investigación se ocupa de las genealogias de cómo los cuerpos y las tecnologías se han constituído mutuamente. Se pregunta por las corpo-realidades y su orientación hacia lasinterfaces paramétricas, y mira a las anatomías que están constreñidas computacionalmente por los requerimientos del modelado-en-maya. Invita a la generación de conceptos y renders experimentales, combinaciones salvajes y prototipos (digitales o no) para encarnaciones diversas. Para esta rotación, Possible Bodies gira hacia los fenómenos del 3D. en el contexto de Bau (Centro Universitario de Diseño de Barcelona), nos preguntamos cómo tomar el dispositivo de escaneo, modelado y traqueo 3D si realidad no implica ni hecho ni verdad, y virtualidad no significa ni ficción ni mentira. Del diseño de videojuegos a la moda, del diseño de interiores al grafismo, del audiovisual a la fabricación... el diseño funciona en el continuum industrial de las tecnologías 3D y todas esas industrias están entramadas en y afectadas por la producción de los (llamados) cuerpos y (sus) verdades. Jara Rocha, Femke Snelting: "Possible Bodies"
Kym Ward: "Circluding, el fanzine"
Simone C. Niquille: "Verdad paramétrica, HD Ready"
Paula Pin: "Biocomplexity: estrategias y fricciones emergentes"
Actividad gratuita y de libre acceso. 23/11 16-20h: Taller "Intimate Biometrics"
24/11 9h-20h: Taller "Signos de desorden clandestino en la muchedumbre uniformada y codificada"
Con Possible Bodies. Plazas limitadas para estudiantes de 1º del Grado en Diseño. Karen Barad: "Getting Real: Technoscientific Practices and the Materialization of Reality"
Con Possible Bodies y Kym Ward. Possible Bodies (Jara Rocha, Femke Snelting) is a collaborative research on the very concrete and at the same time complex and fictional entities that "bodies" are, asking what matter-cultural conditions of possibility render them present. This becomes especially urgent in contact with the technologies, infrastructures and techniques of 3D tracking, modelling and scanning. Intersecting issues of race, gender, class, species, age and ability resurface through these performative as well as representational practices. The research is concerned with genealogies of how bodies and technologies have been mutually constituted. It interrogates corpo-realities and their orientation through parametric interfaces and looks at anatomies that are computationally constrained by the requirements of mesh-modelling. It invites the generation of concepts and experimental renderings, wild combinations and digital and non-digital prototypes for different embodiments. For this rotation, Possible Bodies turns to the phenomena of 3D. In the context of Bau college of design, we are wondering how to grasp the apparatus of 3D scanning, modelling and tracking if reality does not mean fact nor truth, and virtuality does not mean fiction nor lie. From gaming to fashion, from interiors to graphics, from audiovisual to fabrication... design functions within the industrial continuum of 3D technologies and all of these industries are deeply entangled with and affected by the production of (so called) bodies and (their) truths. The modern regime of truth still tangibly affects daily lives and how they are lived. What worries Possible Bodies is the way that volumetric calculations and their technological matrix are infused with anatomic science, combined with a parametric understanding of matter and fixed modes of perspective. Together they seem to have travelled untouched into 3D technologies, carrying their colonial, racist, misogenist, ageist and ableist values into their code-base, interface design, visual culture and teaching methods. Karen Barad talks about the phenomena that result from the "intra-actions of multiple apparatuses of bodily production". The notion of the phenomena helps to understand that bodies are technological, calculated productions that we learned to comprehend and in-habit. We urgently and clumsily take Barad's hand and ask: if bodies are lively political fictions, what is the phenomenal body of 3D truths? And from there on: how can we provide ourselves with 3D toolmaking processes and vocabularies that extend bodily fictions beyond -or below- the modern regime? With contributions by: Jorge Luis Marzo, Simone C. Niquille, Paula Pin, David Ricart, Jara Rocha, Femke Snelting, Kym Ward, Objetologías research line, CFD's team, the Project area at Bau and many others. Simone C. Niquille: "Parametric truth, HD Ready"
This activity is free and open to everyone. 23/11 16-20h: Workshop "Intimate Biometrics"
24/11 9h-20h: Workshop: "Signs of clandestine disorder in the uniformed and coded crowd"
With Possible Bodies. Places limited to first years students in design. With Possible Bodies and Kym Ward. 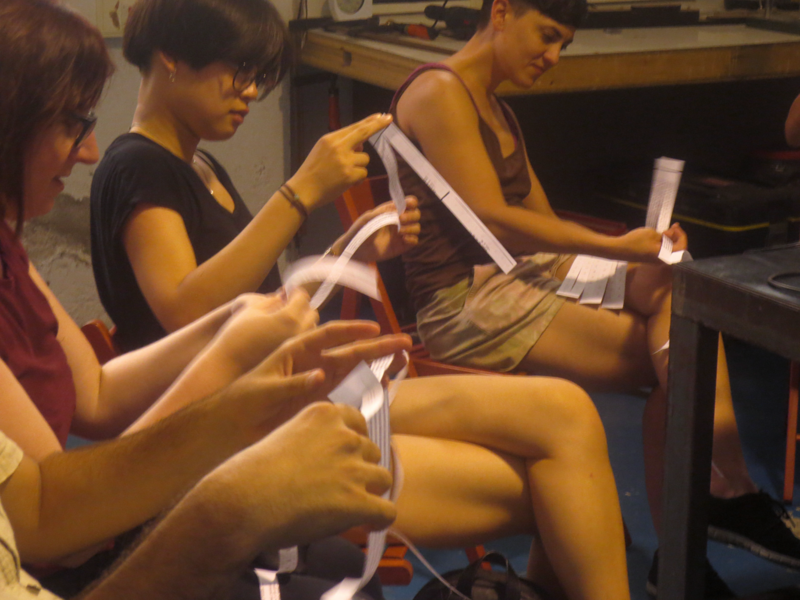 This summer, the Possible Bodies inventory rotates towards Hangar (Barcelona) for a two-week residency. The two year inquiry operates along an inventory that contains a mutating set of artworks, scripts, documentation, manuals, guided tours, interfaces, vocabulary, performances, software-demos, tools, physical objects, animations, mathematical concepts, games, renderings, etc. This travelling collection is a shared context to pay attention to the dimensional, notational, scalable and organisational apparatuses that make so-called-bodies appear and co-relate. This rotation will focus this time on biomedical 3D imaging and how it models, scans and renders "real bodies". Possible Bodies is concerned by the way pharmacopornographic, Hollywood and military industries conflate techniques and technologies. In this techno-colonial and hetero-patriarchal landscape, violent ableist, anthropocentric, misogynous and xenophobe representations keep emerging. In a series of fanzine publications, we will mutate fictional accounts of actual open source projects such as 3D-Slicer, ITK and echOpen with theoretical works of transfeminist sensibility. We want to ask: how does biomedical imaging, both in industrial and DIWO contexts, compose, displace and segment "bodies"? From 20-30 July, Possible Bodies will be working on- and offline with Ona Bros, Sara Lafuente, Max Lehner, Nicolas Malevé, Paula Pin, Peter Westenberg, Kym Ward, L’Institut de Diagnòstic per la Imatge in Tarragona and other companions, stretching and editing the inventory into a series of fanzines that will be published on the Hangar website and distributed physically after the residency. If you are interested in meeting us, we will be in La Plaza every day. You are welcome to visit the inventory, and to join the process of inventorying. To catch us, write to [jara at riseup dot net]. On Thursday 27 July at 17:00 and 18:00, Jara Rocha and Femke Snelting will make guided tours through the items and discuss the issues at stake in the project. The first tour critically explores several biomedical imaging techniques, the second (in collaboration with Kym Ward) will use the notion of 'Circluding' as an orientation device. This activity is open to the public, and entry is free. Possible Bodies Rotation I: Collective Inventorying took place in May 2017 at Akademie Schloss Solitude / Projektraum Römerstraße, Stuttgart and gathered software performers, raw artists, somatic developers, sensitive activists and disobedient academics. Este verano, el Inventario de Possible Bodies rota hacia Hangar para una residencia de dos semanas. Esta investigación bienal opera a lo largo de un inventario que contiene piezas artísticas, scripts, documentación, manuales, visitas guiadas, interfaces, vocabularios, performances, software-demos, herramientas, objetos físicos, animaciones, conceptos matemáticos, juegos, renders, etc. Esta colección móvil es un contexto para prestar atención a los dispositivos dimensionales, notacionales, escalables y organizativos que hacen que los “llamados cuerpos” aparezcan y se co-relacionen. La segunda rotación se centra en la imagen biomédica 3D y cómo en torno a ella se modelan, escanean y representan los “cuerpos reales”. A Possible Bodies le preocupa la forma en que las industrias farmacopornográficas, hollywoodianas y militares confunden técnicas y tecnologías. En este paisaje tecnocolonial y heteropatriarcal, violentas representaciones capacitistas, antropocéntricas, misóginas y xenófobas siguen emergiendo. En una serie de fanzines, se van a mutar rendiciones de cuentas ficticias de proyectos reales de código abierto como 3D-Slicer, ITK y echOpen con trabajos teóricos de sensibilidad transfeminista. Queremos preguntarnos: ¿cómo la imagen biomédica, tanto en contextos industriales como DIWO, compone, desplaza y segmenta a los “cuerpos”? Del 20 al 30 de julio, Possible Bodies trabajará desde Hangar, on- y offline, con Ona Bros, Sara Lafuente, Max Lehner, Nicolas Malevé, Paula Pin, Peter Westenberg, Kym Ward, L’Institut de Diagnòstic per la Imatge Tarragona y otras compañías, estirando y editando el inventario en una serie de fanzines que serán publicados en la web de Hangar y también distribuidos físicamente tras la residencia. Si te interesa acercarte, estaremos en La Plaza todos los días. Estás invitada a visitar físicamente el inventario y sumarte al proceso de inventariado. Para dar con nosotras, escribe a [jara at riseup dot net]. El jueves 27 de julio a las 17:00 y a las 18:00, Jara Rocha y Femke Snelting harán visitas guiadas a través de los ítems y discutirán algunos asuntos clave del proyecto. El primer tour explorará críticamente varias técnicas de imaginación biomédica; el segundo (en colaboración con Kym ward) usará la noción de “Circluding” como un dispositivo de (des)orientación. Esta actividad es abierta al público, y la entrada es gratuita. Possible Bodies Rotation I: Collective Inventorying tuvo lugar en mayo de 2017 en la Akademie Schloss Solitude / Projektraum Römerstraße, Stuttgart y reunió a performers de software, artistas en bruto, desarrolladoras somáticas, activistas sensibles y académicas desobedientes.